It's the best spiritual successor to a spiritual successor to a freeware game so far this year. 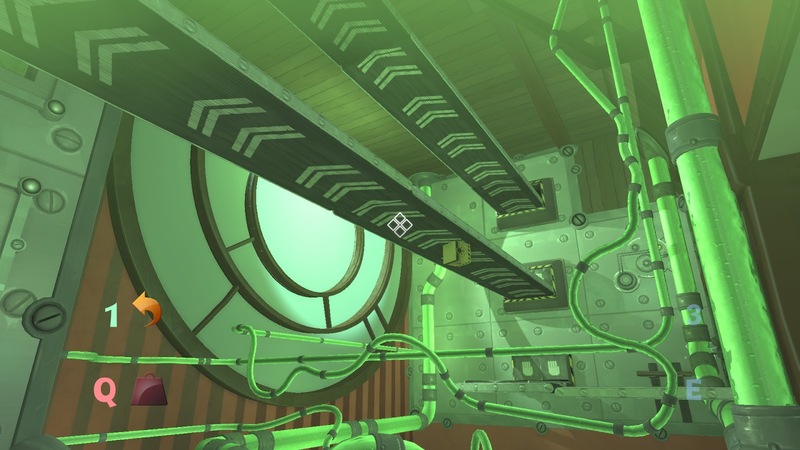 It's hard not to get déjà vu when jumping into Quantum Conundrum, seeing as this is yet another first-person puzzle platformer from the mind of Kim Swift. 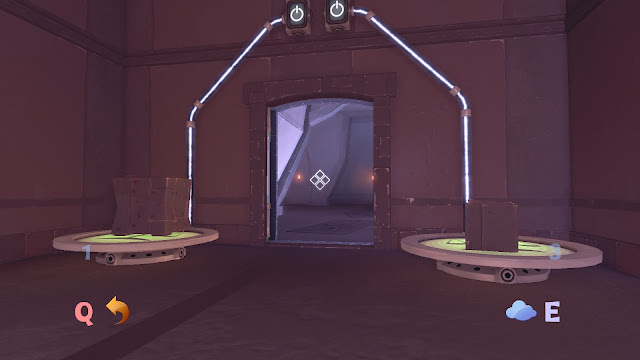 Like her groundbreaking work on Portal, you can expect to be flying through the air more than most planes, only ever hearing one voice from start to finish, and seeing a lot of buttons alongside their natural predator; boxes. Though, in spite of this title being a spiritual successor to one of the greatest video games to come out this decade, it doesn't have the same magic - but is still nevertheless worth checking out. Being the nephew of the genius inventor Professor Fitz Quadrangle has its perks. Every time your mum drops you off at Quadrangle manor, he surprises you with one of his amazing new inventions. However, this time around, something goes terribly wrong, and you're tasked with navigating through the manor that has been re-purposed to test his latest contraption: the Inter-dimensional Shift Device, or IDS device for short. Once you get your hands on it - or to be more precise, 'it' on your hands, because it's a glove - the IDS device allows you to access up to four dimensions. This gives a whole new meaning to physics-based puzzles since the physics of the environment is literally in your hands. For example, if there are objects that are too heavy to lift, switch to the Fluffy dimension, and before your eyes can blink everything will turn light and fuzzy. This is, of course, just a taste of what you can do. There's the opposite of the Fluffy dimension known as the Heavy dimension, where everything is denser, and very helpful in making tougher objects to protect yourself against lethal hazards. Not to forget the Slow dimension, for when some precious extra time is the only thing stopping you from plummeting to your death. Then there's the Reverse Gravity dimension, the most fun of all of them. Later in the game, a good number of the manor's rooms are on a grander scale, and are cleverly devised so that all four of the dimensions need to be used. Unfortunately, the puzzles are not that challenging. 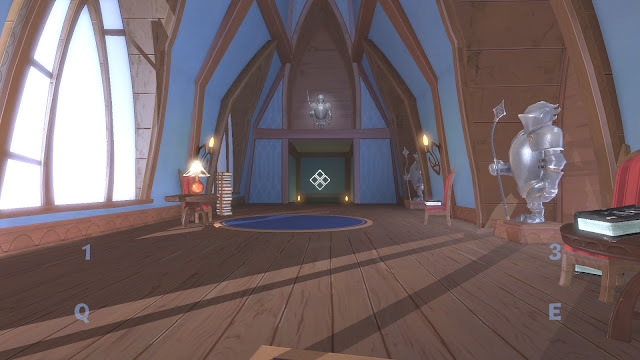 Don't get me wrong, the rooms are difficult; but the puzzles themselves are not. It's a juggling act to switch between dimensions, requiring timing and co-ordination, yet, for the most part, the rooms don't draw out any lateral-thinking skills. In fact, you will feel less like a puzzle-solver and more like an inter-dimensional acrobat considering precision and accuracy is more important than anything else - especially whenever platforming. While there is still a challenge in Quantum Conundrum, don't expect it to stress your brain, just your reflexes. What surprised me, though, is the strong driving force of the story. 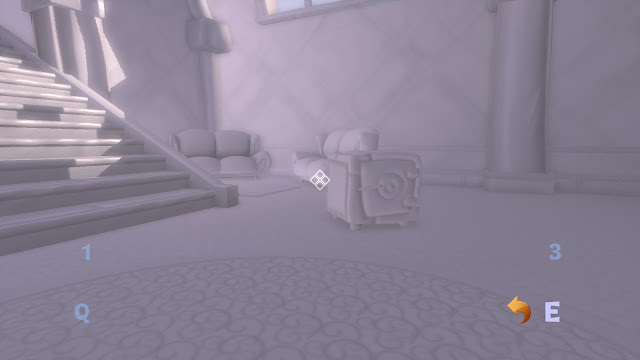 Shortly after arriving, something happens that leads to your uncle suffering from amnesia and disappearing to some unknown place, along with the manor's power being turned off. He can still communicate with you over the manor's intercom system, though. So your eccentric uncle, voiced colourfully by John de Lancie - between his funny technobabblic ranting - helps you in unraveling the mystery that is afoot. This will hook you in and keep you puzzling all the way to the end. 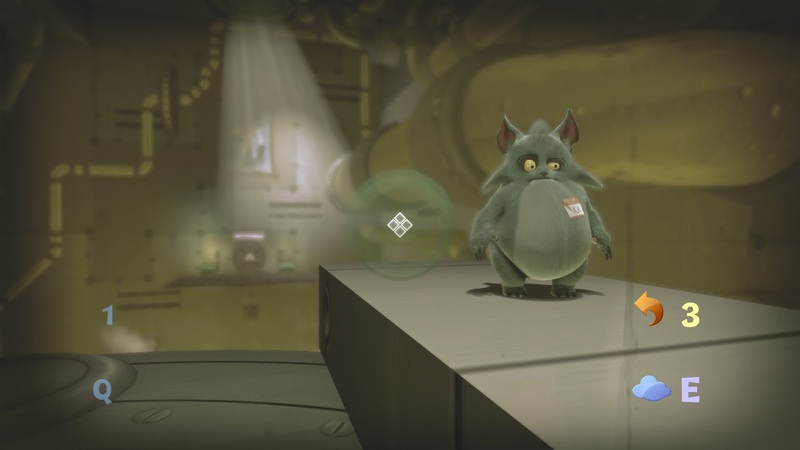 Along the way you will also be helped by a small critter named Irk, Professor Fitz's pet thing, who looks like it was plucked straight out of a Dr. Seuss story book. It lies somewhere between cute and creepy, and bizarrely enough, it wears a name-tag. You will, however, grow on the little shy guy, seeing as it's always by your side. Quantum Conundrum looks and sounds great for a small-ish puzzle game. The visuals are not graphically impressive, but make up for it by giving off a zany vibe. Everything, from the hilarious painting mounted on the walls to the cartoonish gizmos scattered around the manor, make this a wacky sci-fi adventure romp. The score matches this tone, but it's more in the background and doesn't leave that much of an impact. Plus, it must be noted that you are treated to a song at the end credits, a la Portal. The sound design, on the other hand, is perfect. In the Heavy dimension, objects loudly clang when dropped, while in the Fluffy dimension, they softly thud. The best is the Slow dimension, where all noises are slowed down to a crawling pace, and listening to them is mesmerizing. Simply put, it's sound like this that convinces you that you're actually there, traversing through dimensional rifts. At around five hours, the game is not long by any stretch of the imagination. To counteract this, there are plenty of added incentives that will entice you to come back for more, such as collectible items, unlockable achievements, and an in-depth leaderboard. If you're a completionist, these will keep you occupied for a very long time, but for only $15, the single player campaign alone is already a great deal. It's unfair to compare Quantum Conundrum to Portal since Portal has a special quality about it that no other game can capture. Still, there's much to like about Kim Swift's latest project. The story never falters and will keep you interested, if not at least intrigued, all the way to the end thanks to Irk and Professor Fitz Quadrangle. These two will also help in guiding you through the puzzles, despite the fact that no help is need in solving them. What it lacks in puzzling, though, it sure makes up in platforming, as it will test your jumping and maneuvering a lot - without ever feeling unfair. Basically, it's a game that came out of nowhere and is surprisingly good, as it offers an inventive gameplay experience. Go ahead and take a look at Quantum Conundrum, you won't be disappointed.